Central Vertigo vs. Peripheral Vertigo: What’s the Difference? Home/Vertigo / Dizziness / Menieres/Central Vertigo vs. Peripheral Vertigo: What’s the Difference? Vertigo is the terrible and unsettling sensation of having your environment whirl around you or the feeling that you are spinning out of control even though you’re not actually moving at all. If you’ve ever ridden a spinning amusement park ride or played a game of “dizzy bat”, you can understand firsthand what vertigo feels like. However, for true vertigo sufferers, this feeling can happen for seemingly no reason, all of a sudden, at any time. It’s important to understand that vertigo is not its own diagnosis. Rather, vertigo is a symptom that occurs with many diseases and conditions, and it’s essential to understand where it’s coming from in order to take the right approach to care. The two most common categories of vertigo are usually labeled as either central or peripheral. In short, the difference between central vertigo and peripheral vertigo is the source of where the symptom of vertigo is coming from. Central vertigo is directly related to issues within the central nervous system (CNS), while peripheral vertigo is typically caused by problems in the inner ear. Multiple Sclerosis (MS): Multiple sclerosis is an unpredictable disease of the central nervous system which causes the erosion of the myelin sheath that surrounds nerve tissue. This leads to impaired CNS function that can cause a variety of neurological symptoms, including vertigo. Vestibular migraine: Vertigo and dizziness is a complaint that approximately 40% of migraine sufferers report. Vestibular migraine may also be referred to as migrainous vertigo, migraine-associated vertigo, or migraine-associated dizziness. Vascular disease: Any condition that has a negative effect on blood flow has the potential to result in vertigo. Atherosclerosis (plaquing in and hardening of the arteries), hypertension (high blood pressure), aneurysm (a weakening in the lining of an artery wall that balloons out and causes leakage), and embolism (blood clot in an artery that can become dislodged and migraine to the brain or vestibular system) are all examples of vascular diseases that can lead to central vertigo. Stroke: A stroke occurs either from abnormal bleeding on the brain (hemorrhagic) or from a lack of oxygen to brain tissue (ischemic). A stroke is an urgent medical emergency, and vertigo can be one of the first symptoms to arise. If there are other stroke symptoms present, such as facial drooping or impaired speech, immediate emergency care should be sought out. Transient ischemic attacks, or “mini” strokes, are also a possibility. Tumor: A tumor, whether benign or malignant, can be the cause of central vertigo. Any tumor that affects CNS function, particularly in the area of the brainstem or the vestibulocochlear nerve, can result in vertigo. Medication side-effect: Vertigo can be a side effect of many categories of medication, including antidepressants, anticonvulsants, blood pressure medications, contraceptives, sedatives, and anti-inflammatories. Benign paroxysmal positional vertigo (BPPV): BPPV occurs when calcium crystals that are normally embedded within the inner ear dislodge and migrate into the fluid-filled canals where they don’t belong. The crystals disturb the normal movement of inner ear fluid and send incorrect signals to the brain about head and body position, which leads to intense bursts of vertigo. Meniere’s disease: Aside from severe vertigo attacks, Meniere’s disease sufferers will also experience tinnitus, fluctuating hearing loss, and the pressure or fullness in the affected ear. Labyrinthitis: Your inner ear contains a network of fluid-filled canals and sacs that are known as the labyrinth, which aids in both hearing and balance. Infections, usually viral (but sometimes bacterial), can cause inflammation of the labyrinth and result in vertigo, tinnitus, and hearing loss. Vestibular neuronitis: Like labyrinthitis, vestibular neuronitis causes inflammation of the vestibular nerve which sends signals from the inner ear to the brainstem about balance. The main difference is that neuritis will only affect balance, while hearing remains intact. Head or neck trauma: The onset of vertigo frequently occurs in the months or years following a head or neck injury, such as whiplash or concussion. Vertigo is a common symptom seen in post-concussion syndrome as well. 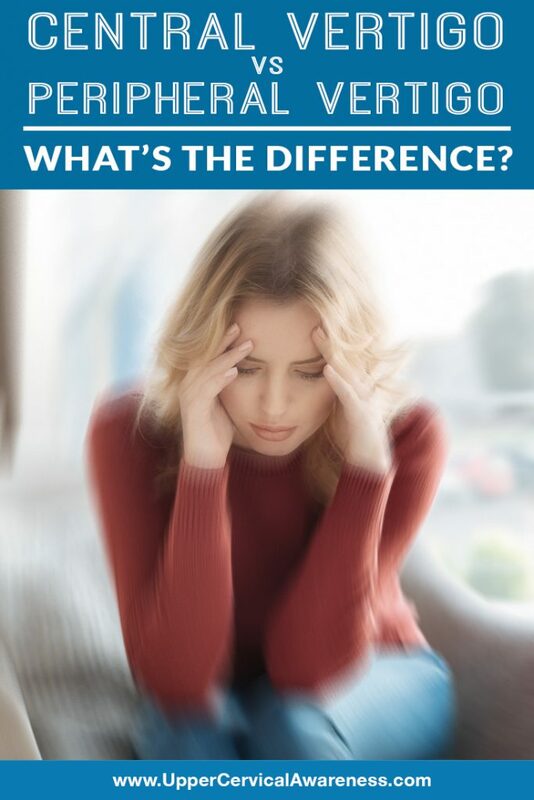 Since there is an established connection between head and neck injury and the development of vertigo, many people living with vertigo-causing conditions are getting great results under upper cervical chiropractic care. Upper cervical care is a subspecialty of the broader chiropractic profession that focuses on the area of the neck where it forms a junction with the skull. This area, known as the upper cervical spine, is made up of the occiput, atlas (C1), and axis (C2). It is arguably the most complex area of the spine and has a unique function in that it must balance the weight of the head and also account for its range of motion. It is because of this freedom of movement that these vertebrae are particularly vulnerable to misaligning. An upper cervical misalignment can contribute to vertigo by preventing normal brainstem function. The brainstem is responsible for the processing and integration of balance signals, and if it’s not doing its job right, vertigo can be the outcome. Upper cervical chiropractors have a thorough understanding of this relationship and by performing a thorough analysis, can customize an adjustment that is tailored for each patient’s needs. This exacting approach allows for gentle, effective adjustments that restore both normal alignment and normal function. Upper cervical care has already helped many vertigo sufferers regain their quality of life. Before resigning yourself to living with the unknown of when your next episode might occur, schedule a consultation with an upper cervical chiropractor near you. Dr. Crowder2019-04-09T09:31:56+00:00April 7th, 2019|Vertigo / Dizziness / Menieres|Comments Off on Central Vertigo vs. Peripheral Vertigo: What’s the Difference?